Created to fill the need for a secure space of physical activity, the Faxinal Soturno cycleway in Brazil also helps reduce pedestrian crashes. This post is part of TheCityFix’s series, “CACS Highlights,” introducing the winners of the Active Cities, Healthy Cities (or “CACS,” its acronym in Spanish and Portuguese) competition. These public projects aim to transform the lives of millions of people through building healthy and altruistic communities. Each project will be honored at the 7th World Congress on Sustainable Transport on October 5, 2011 in Mexico City. A version of this post was originally published by Maria Fernanda Cavalcanti on September 23, 2011 in Portuguese in TheCityFix Brasil. Driver Education for Youth , the winner in the Road Safety category, is a project that aims to teach the basic principles of traffic education to youth in Cerrito, Argentina, located about 520 kilometers (323 miles) from Buenos Aires. Through contests with age-appropriate questions and answers, the local government works to change on-the-road behavior of citizens. Students of public and private schools are invited to test their knowledge in a healthy competition on road safety. While students compete among their age group, they learn about proper road and transit etiquette. Since its inception, the project has reached a high level of popularity in the city, involving not only the youth but also the whole community. Part of the contest also included discussions on the best ways to avoid traffic crashes. According to the project’s organizers, the contest showed an effective response to the attitudes of transit riders and will continue to decrease the number of crashes in the city of Cerritos. The Urgent Life project, through the efforts of the Thiago de Moraes Gonzaga Foundation, promotes a set of projects that aim to raise awareness and humanize traffic. The Foundation’s mission is to mobilize society to change traffic behavior through educational and cultural work. The Foundation also works to promote the appreciation and preservation of life. Learn more about the program here. Road Safety Week, a project planned by Asuncion National Road Safety, comprises a set of strategies and actions to reduce crashes on roads in Paraguay, with the participation of governmental and private institutions and other segments of society. The mission of the National Road Safety Plan is to articulate, coordinate and promote a set of strategies and actions to reduce fatal crashes, disabilities and negative economic impacts caused by traffic crashes. 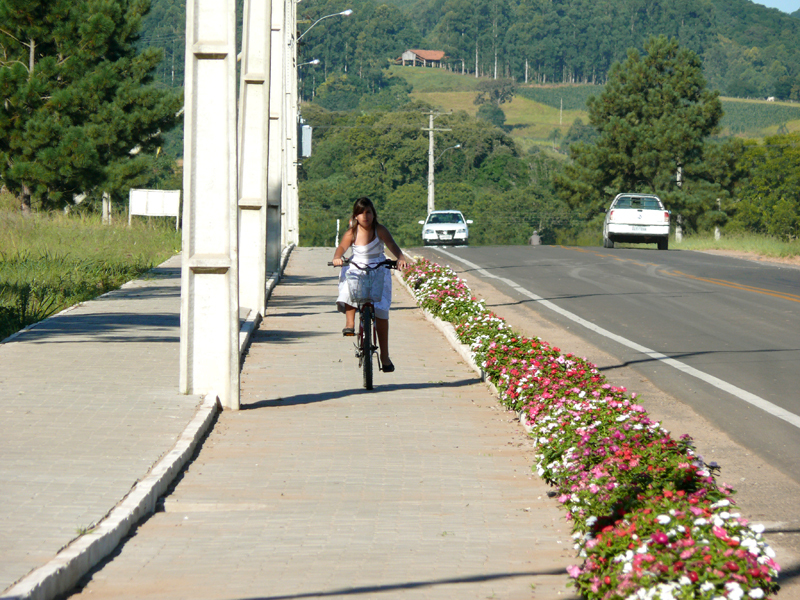 The bike path in the municipality of Faxinal Soturno was inaugurated in 2007 to fill the need for a secure space for physical activity and also to connect the Village Green Roof to the downtown area. The construction of the 1.8-kilometer (1-mile) path drastically brought down the number of pedestrian crashes at the site, which is known for its dense pedestrian and cyclist traffic. Learn more about it here. The creators of Trapa (Pacific Transit) chose a simple and entertaining way to draw people’s attention to their behavior in traffic. Three individuals, each dressed in black and white and carrying banners, provide a theatrical performance on the duality of human behavior. The project that has been taking place on the streets of São Paulo since 2010 mixes improvisation with good humor to convey a message of respect and tolerance in transit. Learn more here. The Mala Project is a channel used for traffic education. In April 2009, teachers of 4th and 5th year students in municipal schools decorated pieces of luggage with themes that refer to human-conscious behavior, both on the part of pedestrians and drivers. Inside the luggage were hundreds of books on the subject and each luggage traveled among the 19 municipal schools. Read more here. This Sunday, Cast Your Votes for "Iniciativa es México"
Vote Now for Active Cities, Healthy Cities!